Export your 3D model to virtual reality, instantly. Find out which 3D modelling software is compatible with LUX Walker in software integrations. LUX Walker is compatible with most 3D modeling applications. Export your 3D model as a .obj file to easily import into LUX Walker. 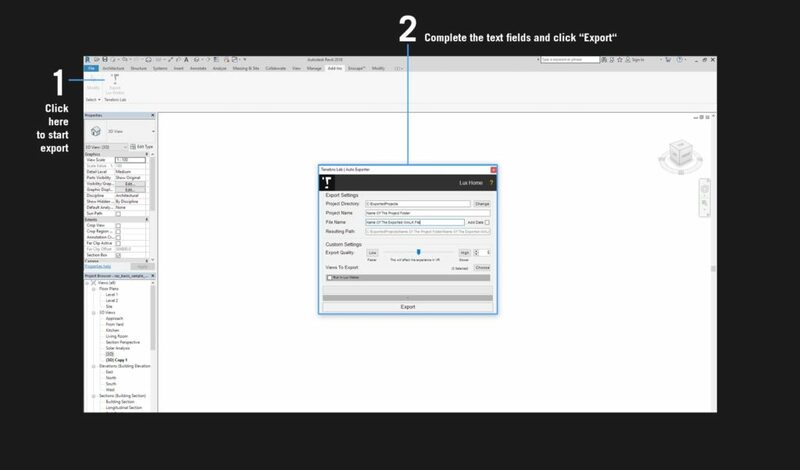 When using Revit or Sketchup, use our plugin for a seamless one click export process. Click on the Tenebris Lab icon to start the export process. Complete the Project Directory, Project Name and File Name fields. Simply click export to see your model in LUX WALKER.